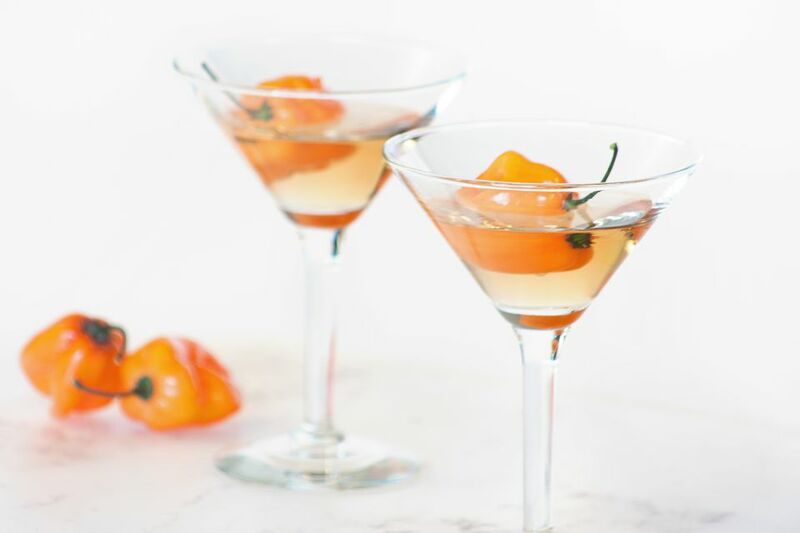 The habanero martini is a drink for anyone who has a taste for all things hot and spicy. It holds a fantastic flavor and takes the basic tequini to a new level of interesting. This spicy cocktail recipe is very simple, combining a smooth reposado tequila with dry vermouth. A single habanero pepper is added as a garnish and dropped inside the glass. The pepper will infuse the drink with its flavor, much like olives add their briny taste to the classic gin martini. The flavor infusion begins within the first minute and will only intensify the longer it sets. The drink doesn't get as hot as you may expect, though. It's actually a very nice spiciness that anyone who appreciates a little heat will enjoy. It pairs perfectly against the gentle oak notes of the aged tequila and is a delight to sip for dinner or any occasion. In a cocktail shaker filled with ice, pour the tequila and dry vermouth. It's not recommended that you eat the pepper when the drink is gone. However, washing your hands after handling it is a wise move. Definitely, don't touch your eyes or face before doing so! There's no need to cut the pepper because it will infuse the martini perfectly when left whole. Keep in mind that most of the heat from any chili pepper is in the capsaicin-holding white flesh inside. If you cut a slit in it or cut it in half, the liquid will touch this and become spicier more quickly. Once you find that the habanero martini hits your ideal flavor, remove the pepper to prevent the flavor from developing further. This is a particularly good idea if you tend to take your time enjoying the drink. Any other hot chili pepper can be used instead of the habanero. Jalapeño is a popular choice and Thai chili peppers can really give it a boost. It's best to avoid any peppers that are hotter than the habanero on the Scoville Scale—sorry, no ghost peppers. They are simply too hot and do not make a pleasant drinking experience. Daring yourself to sip a super hot drink is not fun because it's not like food that offers other ingredients to absorb the heat. It also has the potential to be dangerous by burning your mouth and throat. Besides, you probably won't drink all of it and will just be wasting perfectly good tequila. If you prefer, pour a silver (blanco) tequila rather than a reposado. You will get a very nice drink, though it will not have that oak flavor that comes from barrel aging. How Strong Is the Habanero Martini? Not only does this cocktail have the potential to be hot and spicy, it's also rather potent. It may be best to limit yourself to one per night because the alcohol content is around 27 percent ABV (54 proof) when made with an 80-proof tequila. This is average for a martini-style drink and slightly weaker than a straight shot of tequila.